Do you manage a restaurant near Ambassadors Theatre? Click here to contact us and get listed. 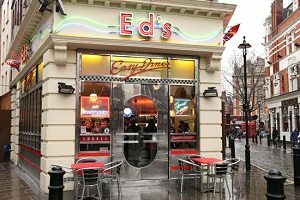 Located just off Charing Cross Road, Ed’s is part of the vibrant entertainment hub of London’s West End. With an entirely American Diner theme, it’s easy to feel like you have stepped back in time to the 1950’s or onto the set of Grease! With the style of the restaurant reflected in the gut busting menu, there are all the hamburgers, hot-dogs fries and onion rings your heart could desire! Of course there is also a fine selection of diner style milkshakes and dessert sundaes! The best thing about Ed’s, aside from the food, is that it won’t break the bank! Call 020 7434 4439 for further information.